Chennai Super Kings beat Kolkata Knight Riders by five wickets at Eden Gardens in Kolkata on Sunday. Suresh Raina scored a half-century and shared a match-winning stand with Ravindra Jadeja, who contributed with a fearless 17-ball 31. Earlier, Chris Lynn dominated Kolkata’s innings by scoring 82 runs off 51 balls. Sunil Narine looked like a spectator scoring 33 off 31 balls. A 200 plus was in cards, but Imran Tahir spoilt the show for KKR. Tahir claimed his IPL-best figures of 4/27 to help CSK restrict KKR. The dangerous Andre Russell was dismissed at 10, while Nitish Rana was gone at 21 and Robin Uthappa went for a duck. KKR finished at 161 for eight in their allotted 20 overs. While chasing the getable total CSK lost Faf du Plessis on 24, MS Dhoni and Suresh Raina partnered a 40 run stand. However, when Narine dismissed Dhoni CSK were in deep trouble at 121/5. They needed 41 runs off 26 balls. Raina and Jadeja held their nerves to finish it off for CSK. 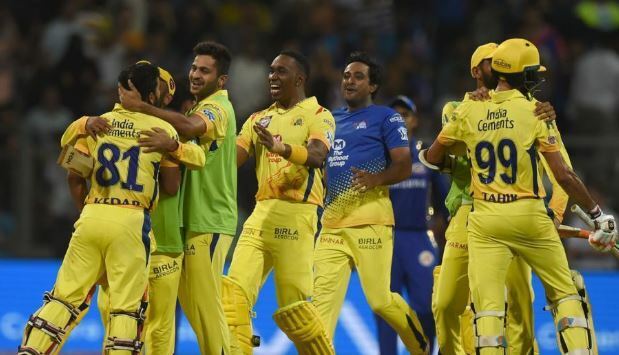 In the last two overs CSK required 24 runs to win, Jadeja smashed Harry Gurney for three successive fours to make it just a formality in the last over. The visitors chased down the target with two balls to spare, Suresh Raina finished unbeaten on 58 and Ravindra Jadeja was not out on 31. Chennai Super Kings are at 14 points on the table, in another match the defending champions should seal a spot in the play-offs. Over the years, 16 points had been the cut off for a berth in top four.